What is anabolic? Protein synthesis. Nitrogen retention. "Nutrient-partitioning". 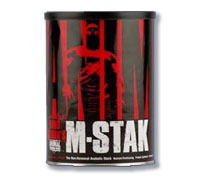 The all new Animal M-Stak. A natural supplement which helps boost anabolism and perfect for the classic "hardgainer" in all of us. Directions: Take one pak every day for 21 consecutive days. On training days, take pak 45 minutes prior to exercise. On non-training days, take pak in the morning or early afternoon. Cycle product for maxium results: three weeks on and one week off. This product contains an extremely powerful flavone and phytoecdysterone complex which may greatly boost performance and muscle size. Please consult your physician before using this product. Not for use by pregnant or nursing women. If you are under a physician's care for any reason, please consult your physician prior to use. Reduce or discontinue use if nervousness, tremors, sleeplessness, loss of appetite or nausea occur. Not for use by persons under 18. KEEP OUT OF REACH OF CHILDREN.